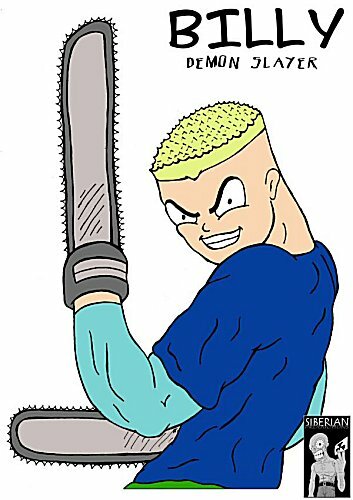 Powers/Abilities: Because he is a Half-Breed, unwritten law states that demons cannot touch him; his weapon of choice is a pair of "Handy-Saws", electric hand-held chainsaws which he picked up at a Supermarket in the first issue. History: Unknown to William Damon, his father was the Devil himself. In spite of this, for many years he lived a normal life, until one day, while out shopping with his mother, Billy was attacked by his Dad's hench-man looking to enlist him as the Anti-Christ. They made a vital mistake in murdering Mrs Damon, causing Billy to grab a pair of "Handy-Saws" (electric Hand-Held Chainsaws) from the shelf behind him. In the chaos that followed Billy made a pledge to get revenge for his mother. A few weeks later Billy ran across his father in a demon pub after a demon snitched on his location, by the end of the confrontation the pub was burning to the ground. In an effort to remove Billy, the Devil enlisted the help of his Half-Breed Assassin team the "Wolfpack". Meanwhile the Trench-Man had plans of his own to test the unwritten law with a shotgun. Billy's Guardian Angel intervened, leading to a confrontation with the Wolfpack. Annoyed with the prospect of losing Armageddon again, the Devil decided on a different plan of attack. With the assistance of Billy's evil twin brother (who had been locked in the deepest pit in Hell for most of his life), the Devil devised a devious plot to attack Heaven directly. Comments: Created by Hayden Fryer. In Issue #4 Billy met up with Biz & B.J from the classic mini-comic series "Smooth" created by Bize Comics in the late 90's; in Issue #5, Biz& B.J. played a few games of pool with Billy and ran into Trevour Bovis from "Greener Pastures". Also featured in the same issue were cameos from Australian Characters. Profile and images supplied by Hayden Fryer.